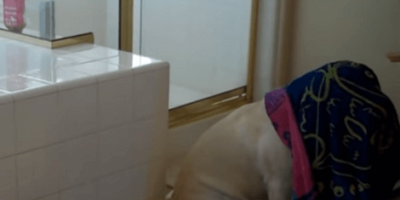 This Adorable Pup Absolutely Loves Taking Baths! Too Cute To Miss! It is a pretty well-known fact that most pups just don’t like taking baths. It is odd, if you think about it – most of them are willing to go diving into rivers and lakes, but they just refuse to take baths with Mom and Dad! Or if they are, they are usually super excited about all of it. Labrador Retrievers are best known for having incredibly high energy levels, but Max here is a darling exception. He is a pretty tolerant and chill pup, and loves nothing more than to relax in a tub – which makes it quite easy to bathe him! You can see just how he is sitting in the bathtub in these videos, without a care in the world. In fact, it seems that at points he is almost ready to doze off! Once his Grandma comes in, however, this pup is ready to leave the pup and head on out! What Happens When Tiny Puppies Take Over Your Home?! Check This Out!